Hey Dudes, sorry you didn't get any love yesterday. I was just plain busy. Yep, that's it, no great excuse, but if you need something let's just say the dog ate my computer. Are we good? Remember how I waited 5 long months to tell you about the little bambino I'm cooking? Remember how I did that out of fear that this would become a kiddo blog? Well, it seems I know myself well because all my decor hunting these days is baby-related and that's what's translating into my posts. 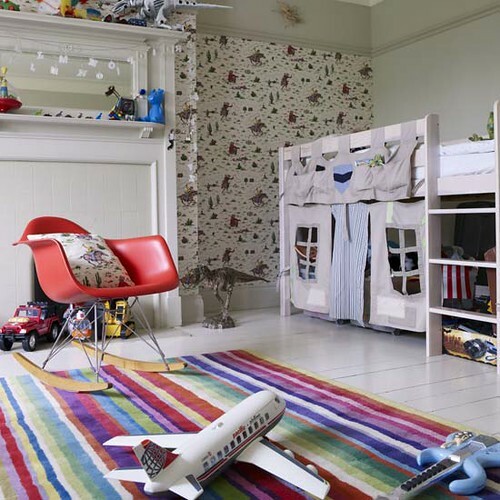 Here are a few of my favorite kiddy rooms from drool-worthy mag, Living Etc. I especially love this room as it is the same color gray as my little guy's. The black accents and cute-o displays are all in the works for his room as well. Now let us all ask our resident criagslist genie, Erin, to pretty please find us a chair that cute and please let it be comfy. I have to admit that I'm not crazy about whatever's happening on the bunk beds over there, but everything else is pretty cute (hello white wood floors!) so this room made the cut. That pinup picture in the bottom right is beyond stupid, but otherwise I love this wall! The end. Cute overload. I also love that this space is gender-neutral without being totally lame. 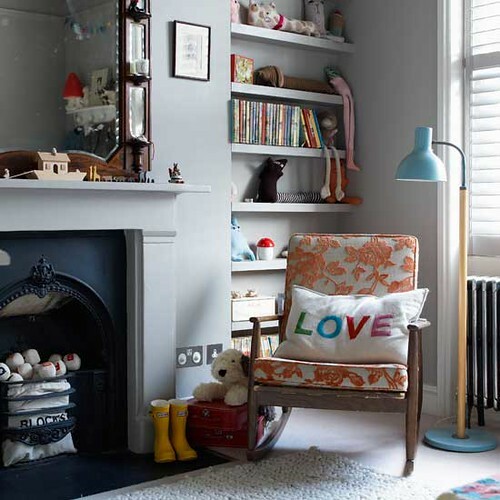 This room wins the award for most adorable shelves and best use of tam tam stool. Ok, now to go tackle a real life kids room. I hope my kiddo appreciates the finer points of modern decor.